Have you ever received a hard, “no”? You know, the kind where you had a lot riding on the answer? Maybe it was a “no” to someone you wanted to marry. Maybe it was a “no” to a job promotion. Maybe it was a “no” to a book proposal. Or maybe it was a “no” to adding to your family. I’ve heard it said that God always answers our prayers, but God’s answer might be “no”, “yes” or “wait, not yet”. He knows what’s best and has eternal perspective. He cares more about what’s good for us then giving us everything we want. He sometimes says “no” so that we can get one step closer to “yes”. In other words, His wisdom, care and timing can be trusted even when the “no” is painful. When we were waiting to adopt, we received a lots of “no’s”. It was difficult to understand what God was doing. It didn’t feel like our hearts were being cared for as we grieved and wondered when our time would come. Yet, each “no” brought us one step closer to “yes”. Read the rest of the story over at c2fast.com. Each day, this month, the #curecancerfast blog is hosting posts about answered prayers. Come on over be encouraged! P.S. Linking up over at Kelly Balarie’s Purposeful Faith today for the #RaRaLinkup and also at Holley Gerth’s Coffee for Your Heart. Join us and be uplifted. Wow Katie, I just read your post over at C2fast. I am in a season where I am waiting to hear a “yes” or a “no”. Ive never looked at the serpants question to Eve quite like you pointed out….”did God really say….? ?” Did God really tell me ? Yes He did, and I need to trust that I am following the path He called me, whether that answer in this season is a yes or a no. May we keep walking the path of faith even when we don’t know where we are going like Abraham. Your neighbor today at Raralinkup. That is an amazing story, Katie. How God gave you all those “no’s,” and then you had to be ready instantly for the “yes!” I can’t imagine getting a call like that: “Can you come pick up the baby in 2 days.” Wow. Gives me encouragement for the “no’s” that God speaks sometimes. HI Betsy: It was such a hard season of “no’s” but by His grace alone, and the prayers of a small army, we didn’t give up. I’m so glad! I really enjoyed this. 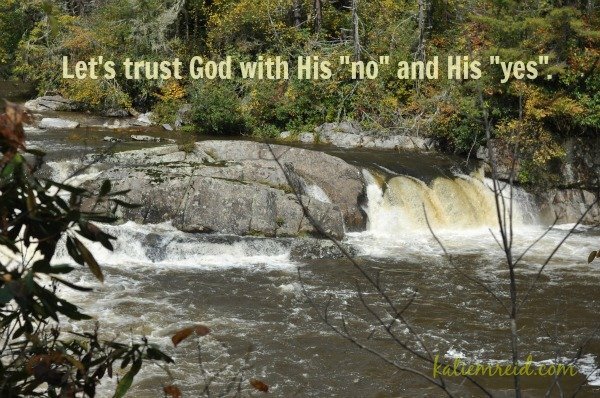 I’ve been seeing God’s faithfulness lately in some of those no’s that are just now turning to Yes. Waiting is hard but God’s timing is perfect. Hi Jen: Isn’t it interesting when we receive a “no” in season we sometimes assume it’s a “no” for the next season too? Glad that you are seeing some “no’s” turn to “yes”. And yes “waiting is hard but God’s timing is perfect”, Amen. I read this last week and meant to leave a word then. This post was so timely! We were praying through something, and God clearly closed the door! Right after He did, I came across your post in my inbox. Although the “no” can be hard and painful, I’m so grateful for God’s protection!